“I spent seventeen years at the Polish philology: five years studying and the rest working in the Polish language department. Those were the most beautiful years of my life; not because I was young, but because I met amazing people here,” reminisced Ludmiła Siekacka, a Polish language teacher and expert at the A. Mickiewicz Secondary School in Vilnius. Polish philology at the Lithuanian University of Educational Sciences, as well as the very University after all, has gone through a lot of restructuring changes; what has changed is faculties, authorities, and names even. Nevertheless, it has always been one of the most important centres of Polishness in Lithuania, as it has prepared teachers for Polish schools – not only teachers of the Polish language and literature, but also those of history, geography, biology, and conducting classes at the very first three grades. Young Poles from Russia and Ukraine have studied in Vilnius, too. All graduates who spoke at the ceremony reminisced the wonderful academic staff: unforgettable long-standing dean of the Faculty of Polish Philology Włodzimierz Czeczot, who treated every student with paternal patience; head of the Department of Polish Genadiusz Rakitski; lecturers Anna Kaupuż, Margarita Lemberg, Irina Kaszkarowa, Helena Gustin, Maria Niedźwiecka. Those days lab assistant Franciszka Tyszkiewicz, or simply Frania, was well-liked as well. 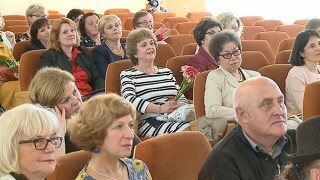 Dean Czeczot was the “father” of Polish philology students, and Ms. Frania their caring “mother”. Currently, the Polish Language, Culture Study and Didactics Centre is formed by people whom the older generation educated. “We’re aware of the fact that it’s not easy to equal them, but, on the other hand, we have a model to follow. We were that lucky as to start working under their supervision. We do not compete with them, but we try to meet their intellectual level, that level of contact, intellectual friendship with the youth, and so we’re constantly working on ourselves,” Dr. Henrika Sokolovska, Director of the Polish Language, Culture Study and Didactics Centre, told Wilnoteka. All employees at the Centre have academic titles, conduct research, publish books, participate in scientific conferences. At its best time the Polish philology was extremely popular with students – at least three candidates applied for one place. Only the best were admitted: fifteen people and additional two or three as auditing students to the full-time course and a similar number of people to the extramural studies. The breakthrough happened after 2008, when studying in Lithuania ceased to be free of charge. The number of students started to decrease. In 2013 the MA studies were shut down. Currently, the four-year BA full-time course is still run by the university. Students gain the bachelor’s degree in Polish philology and pedagogy, as well as qualifications for being a teacher. Studying Polish philology at Lithuanian University of Educational Sciences costs approximately €1,000 per semester – it is quite a high expense. The Polish Embassy in Lithuania tries to save the situation by financing the studies for students who have been admitted to the paid studies since 2011. The future Polonists are supported also by the befriended Pedagogical University of Cracow. “I don’t just believe – I’m sure that, on the occasion of the 60th anniversary, the Association of Poles in Lithuania will be able to announce proudly that it’s funded a scholarship; the Electoral Action of Poles in Lithuania yet another one, the Association of Polish Academics yet another one, the Polish faction in the Seimas as well,” Anna Adamowicz, a lecturer at the Vilnius School of Technologies, Business and Agriculture, well-known storyteller, and graduate of the Polish philology, said half-jokingly at the celebration of the 55th anniversary of the Polish philology.